One month from today, we will be observing a day that I’ve recently dubbed Schenectady’s Date of Infamy, at my other website, “snowmen at the gates”. 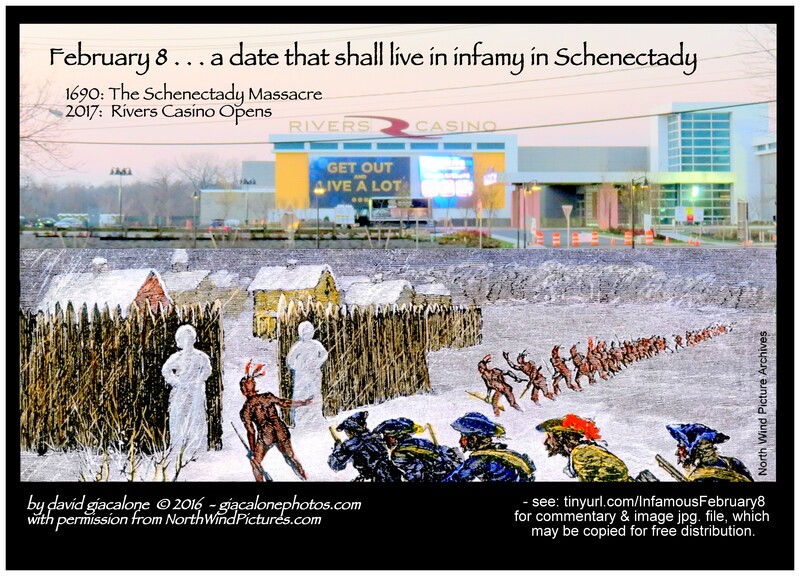 On February 8, 1690, the Schenectady Massacre occurred. On February 8, 2017, the Rivers Casino at Mohawk Harbor will have its opening in Schenectady. I’m writing here to suggest that you read about the coincidence and its unavoidable ironies. Please feel free to click on the Date of Infamy image at the right of this paragraph, which is formatted to be printed in 5″ x 7″ size, or the two other sizes found at snowmen at the gates. You are invited to download, display or distribute (free of charge, please) the Infamy Image, if you agree with the sentiment. Thank you.